Hello there! Welcome to my stop in the blog tour for SEEKER by Veronica Rossi. I'm really excited to be part of the tour, hosted for the awesome Jean BookNerd. For more info and the tour schedule make sure to go HERE. I read Riders, the first book in this series (duology, maybe?) as soon as it came out last year. I didn't remember much of what happened in that first adventure, but Seeker takes place about eight months after the events in the ending of Riders and that helped. For starters, Veronica Rossi did a great job bringing us back to this world with bits of information about those past months and Daryn deciding to fight to get Bas back. While I felt Riders was a little slow, Seeker is an action packed and fast paced story. Sometimes it was creepy and sad and sometimes it was funny and light. Rossi balanced this amazingly, creating the perfect atmosphere for her characters' interactions. 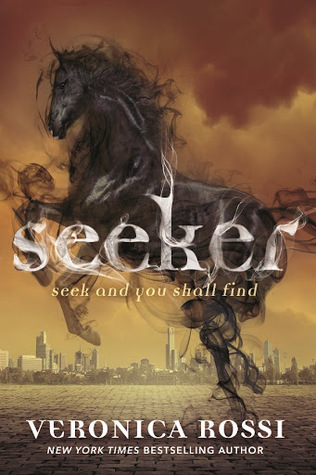 I don't remember feeling this way with the first book, but Seeker reminded me a little of the Soul Screamers series by Rachel Vincent. The demon's dimension was creepy and lividly described, like that in the SS series. I also loved the romance between Gideon and Daryn, after everything I wasn't sure I really shipped them, but these two are adorable and it made my heart happy to see them together. And just to say it, I LOVE a good romance with no love triangle! I'm being really vague with this review, because I'm one of those people who love discovering everything while reading the book. But if there's something I can tell you is that Seeker is an emotional roller coaster with amazing characters, unforgettable friendships, amazing action packed scenes, creepy demons and a very neat and fast paced writing. If you're a fan of the Under the Never Sky series (like me!) I'm sure you'll enjoy this one. And since I've heard many people disliked Gideon's POV in the first book, this one has way more Daryn's. Thank you for being vague! I'm reading this book RIGHT NOW and really liking it. I thought Riders was slow too, and I'm really enjoying the faster pace of Seeker. I liked Riders too though. :D Great post, Lis!